My kids like Rotis for lunch box more than rice varieties. 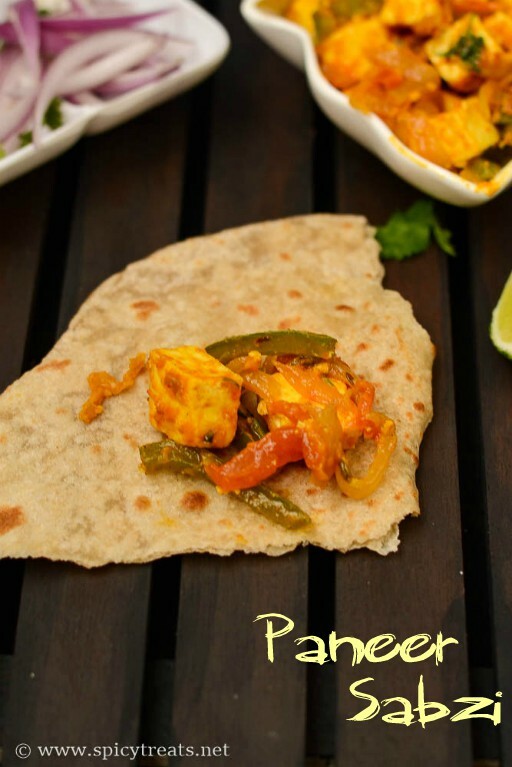 So, I try to make easy and quick dry sabzis for rotis, because it is easy to fill in the roti and roll it as my kids prefer chapati Roll or wrap. 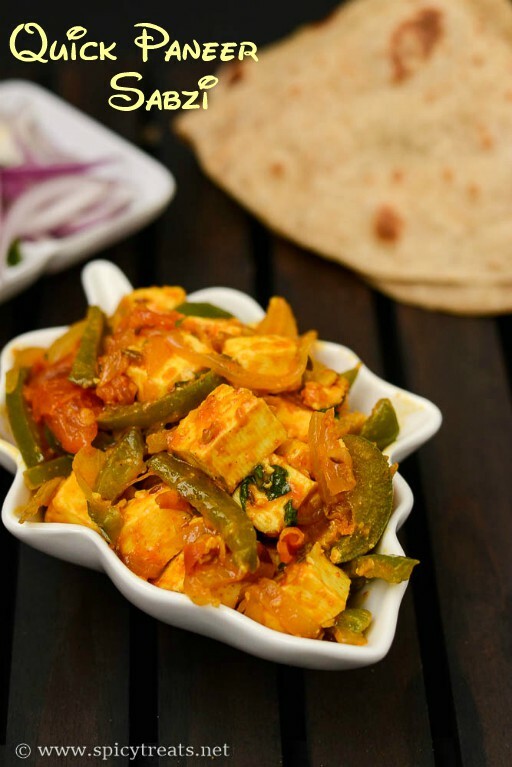 This Paneer Sabzi is one quick and simple recipe that can be done in 15 minutes or less. You can serve as side dish for rotis along with some Raita or fill it in the roti, wrap it as Kathi Roll. Either way it tastes great and kids will love it for sure. 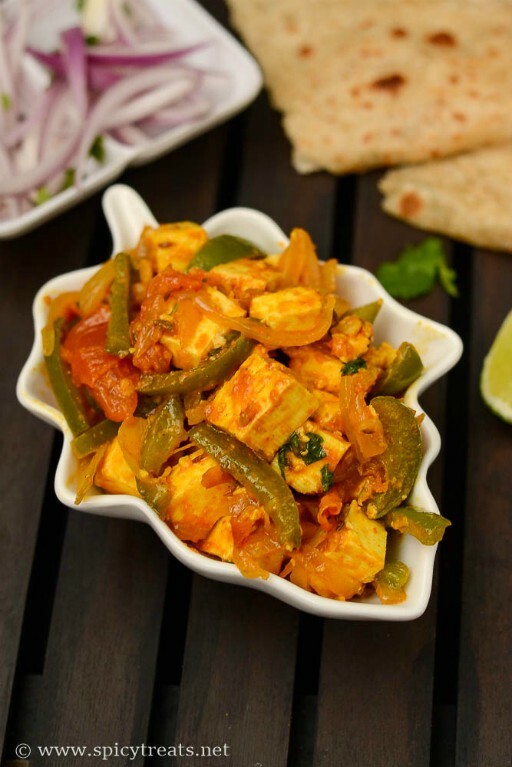 The recipe as follows..
Now add paneer cubes and mix everything well and add 1/4 cup water, stir well and cook covered for 2-3 minutes. You can replace kitchen king masala with garam masala or curry masala powder. Instead of crushed ginger and garlic, use 2 tsp ginger garlic paste. To this sabzi, you can also add some finely chopped carrot and beans and peas to make it even more filling, healthy and colorful. Heat oil in a pan, fry jeera and saunf/fennel seeds. Saute onions, then add crushed ginger garlic saute till the raw smell leaves. Now add paneer, add1/4 cup water and cook covered for 2 minutes. Lastly add cilantro and switch off the stove. 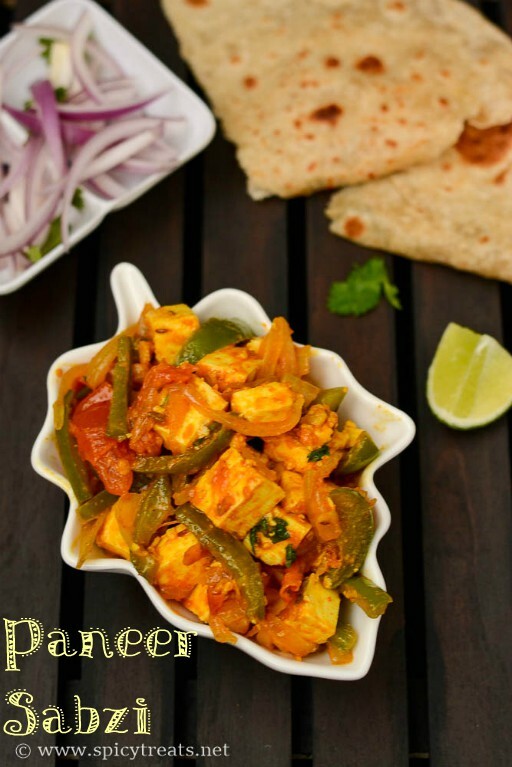 Quick Paneer Sabzi Ready. Yummy , favourite side dish for roti.. I tried ur panner butter masala. I like it.. What is tat kitchen king masala? Whch brand u r using? And wat to be ask in the shop? Kitchen King Masala is a spice powder like garam masala, curry masala...I used Ramdev Brand that is available in Indian Grocery Store. If you couldn't find kitchen king masala, you can use garam masala powder.